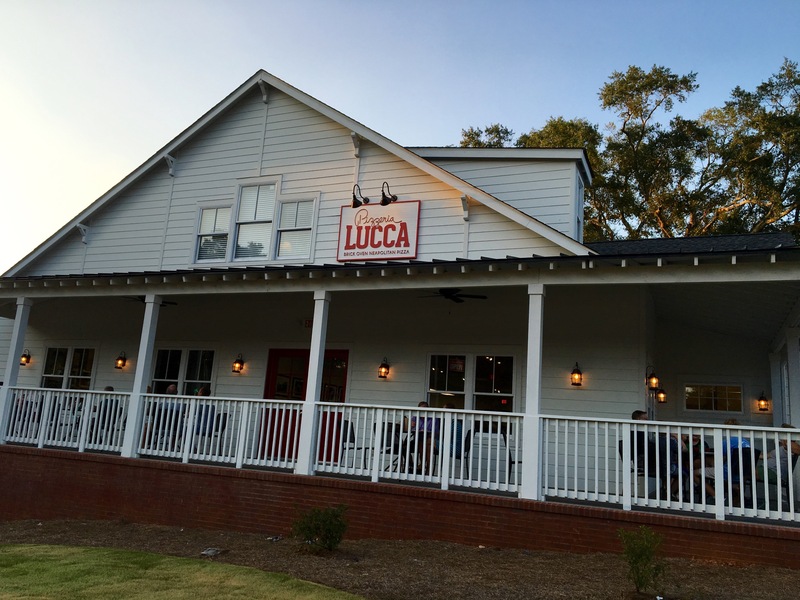 The brainchild of Vic and Diana Bernardini, Lucca is located next to The Mill in Roswell. It still smells like a new building when you walk in. Our first impression is that the Bernardinis should have fired their restaurant designer/architect. The parking lot is miniscule. Expect to have to park on the street on Bulloch Avenue. Practice your parallel parking skills before you go. Bad design flaw #1. When we walked in, we encountered a line. Good news for Lucca. Bad news for the customers in line. As soon as the line forms, nobody can get in and nobody can get out. There’s no place to go to stand in line. Although the line isn’t that long, there are people waiting outside who can’t get in the building. Bad design flaw #2. 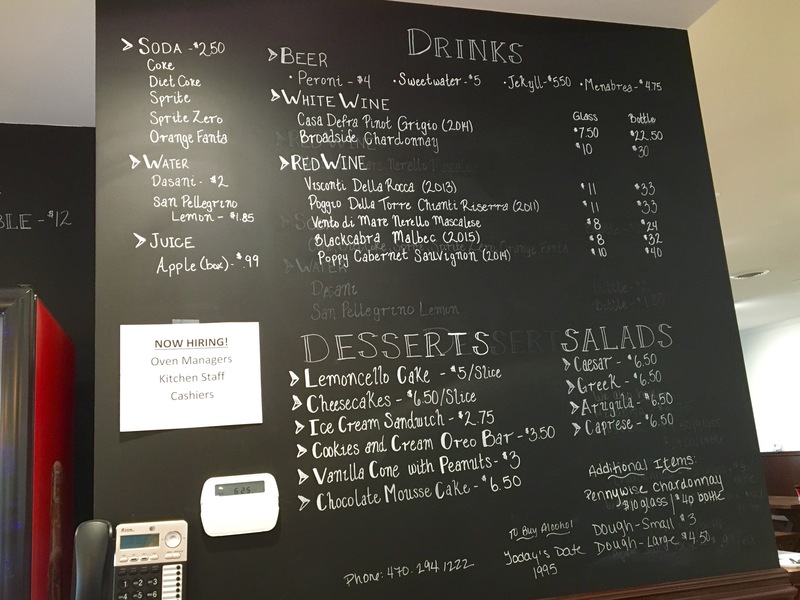 The menu is on a blackboard, or you can get the printed version. You can order one of their creations, or make your own. You can’t do that at Antico. Tip: if you want dessert, it’s best to order it now. 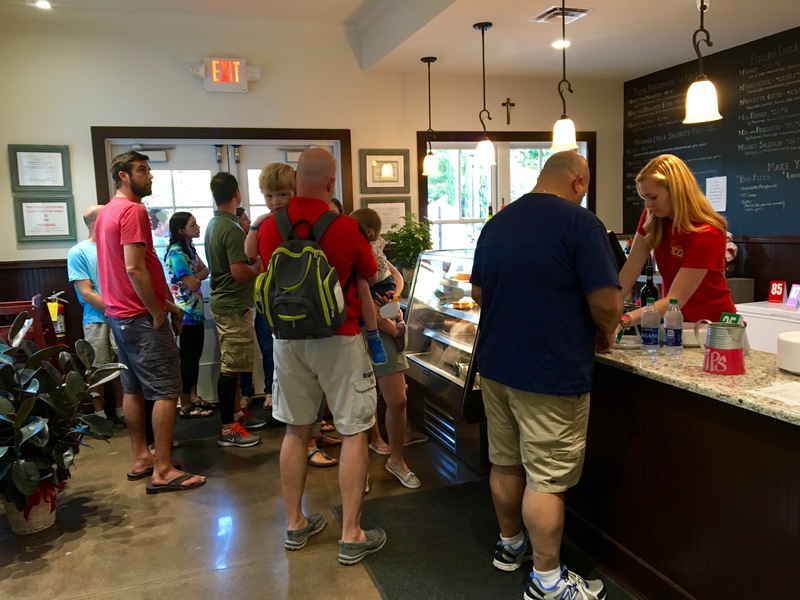 If you come back for it later, you may have to wait in a line all over again. 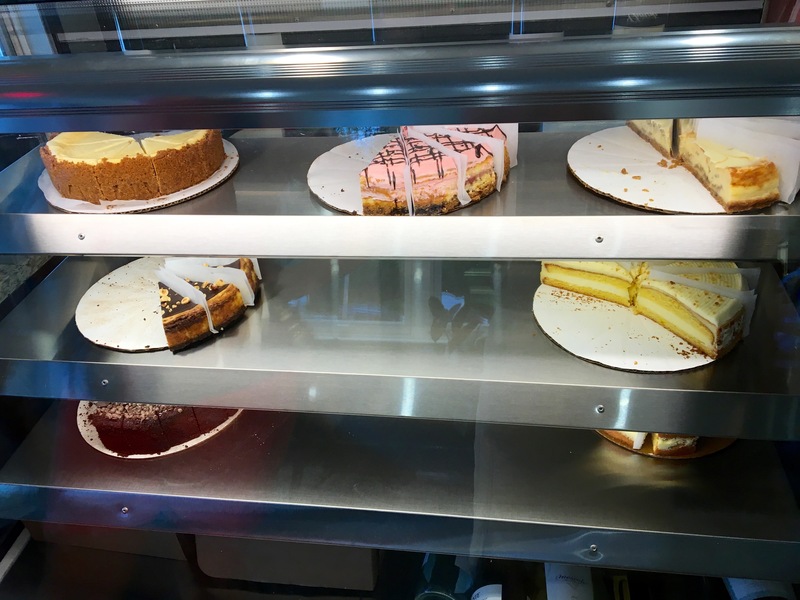 Our guess is that they lose a lot of dessert business, like ours. We had fro-yo down the street after our pizza. The beer is all bottled. No taps for us tonight. The wine is expensive ($11 a glass!) and is poured into plastic cups. We do find a beer of interest from Northern Italy that has not previously passed our palates. Menabrea tastes like a good German lager, and at 4.5% ABV, you can drink this stuff all day. Not us…we only have one each. It’s tough choosing a pizza. There are two sizes, individual and large, which they say will serve at least two people. Go for the large. It’s a better value. Whatever pie you pick, it comes out of one of these three behemoths. 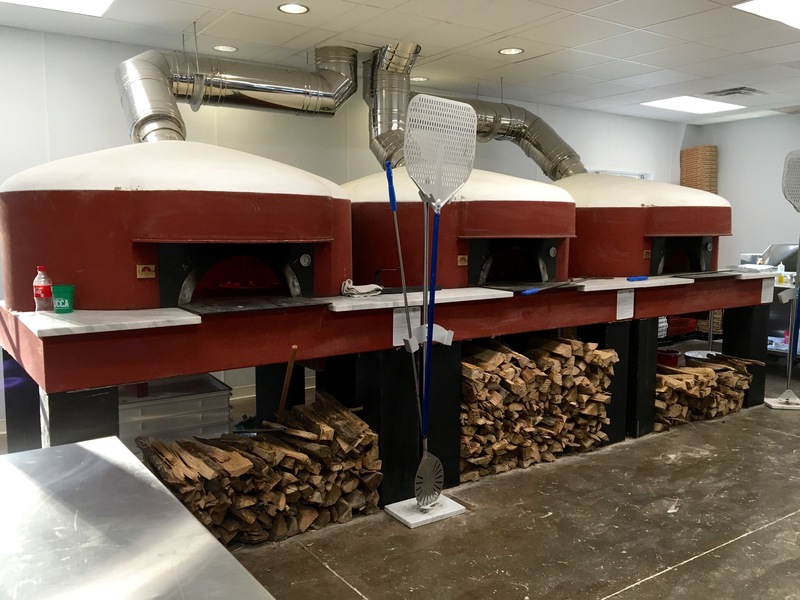 Those are gen-u-ine I-talian wood-fired pizza ovens imported from Naples. (The hyphens are getting out of control!) Remind anyone of Antico? They get really hot, and pizzas cook quickly. Owner Vic doesn’t just oversee the place. He tosses the pizza dough. Date Night loves to see owner involvement. We order and go find a picnic table. 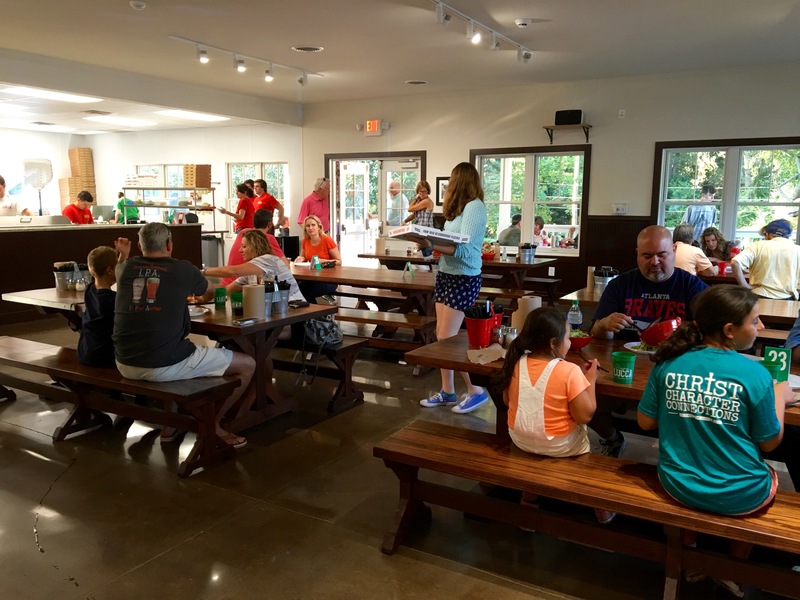 Hmmmm…picnic tables…don’t they have those at you-know-where? 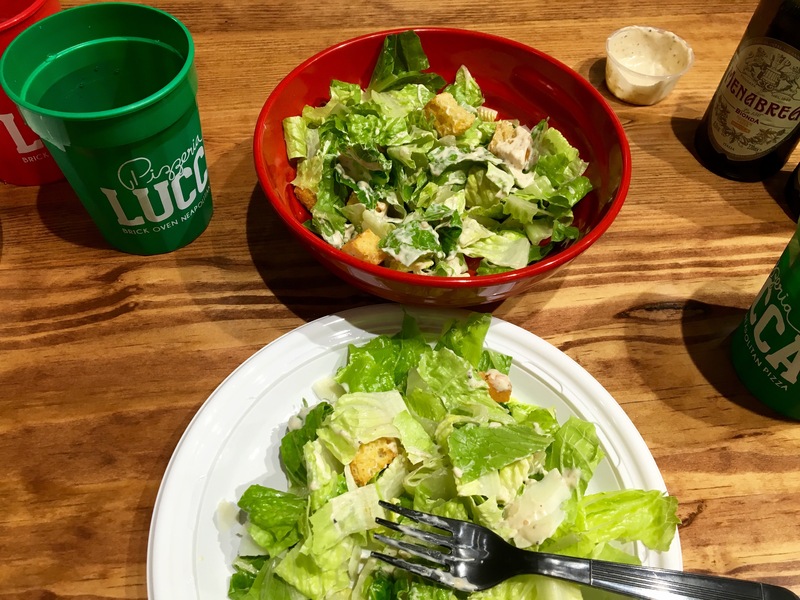 We amuse ourselves with a Caesar salad while we wait for our food. It’s fresh and the big chunks of pecorino cheese are nice. 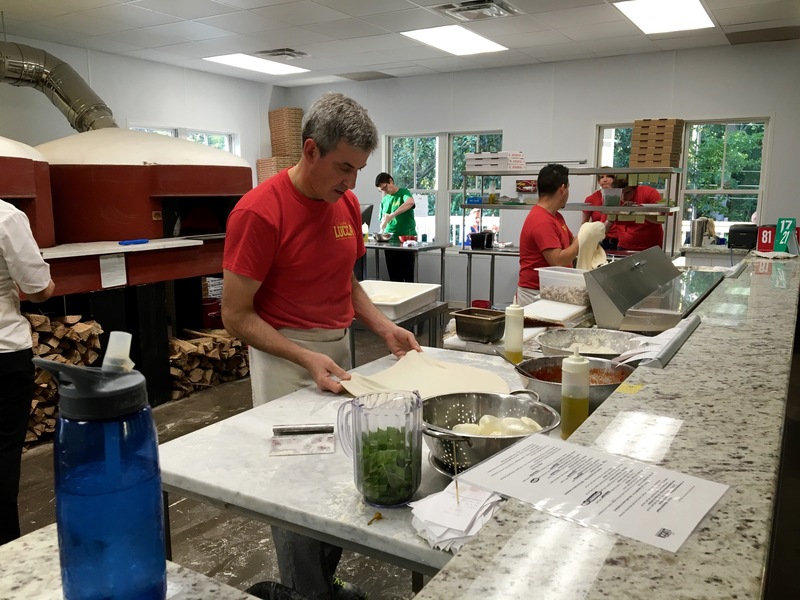 Although they are busy, the pizza comes out fairly fast. 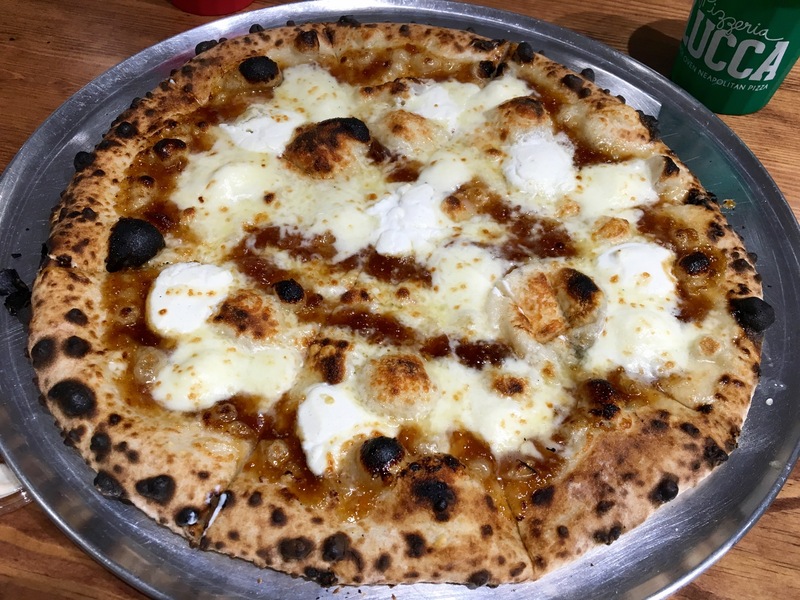 Behold, the fig bianco. 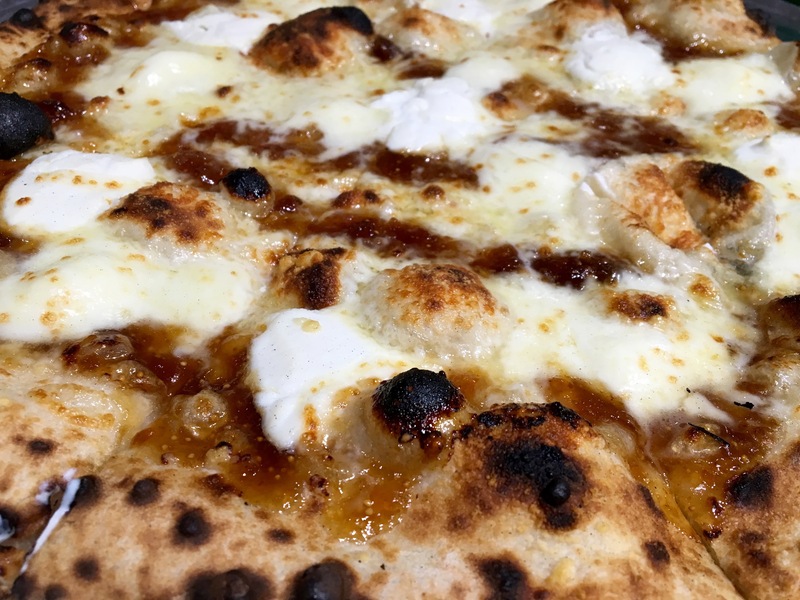 It’s a white pizza with fig preserves, mozzarella, pecorino and ricotta. The preserves make this a sweet pizza. The crust is soft and chewy. I really like the way the cheese tastes with the fig preserves. However, Neapolitan pies should be crispy on the bottom and this one was not. My date prefers a more savory pie and feels like this one is too sweet. Next time, she gets to pick the pizza. 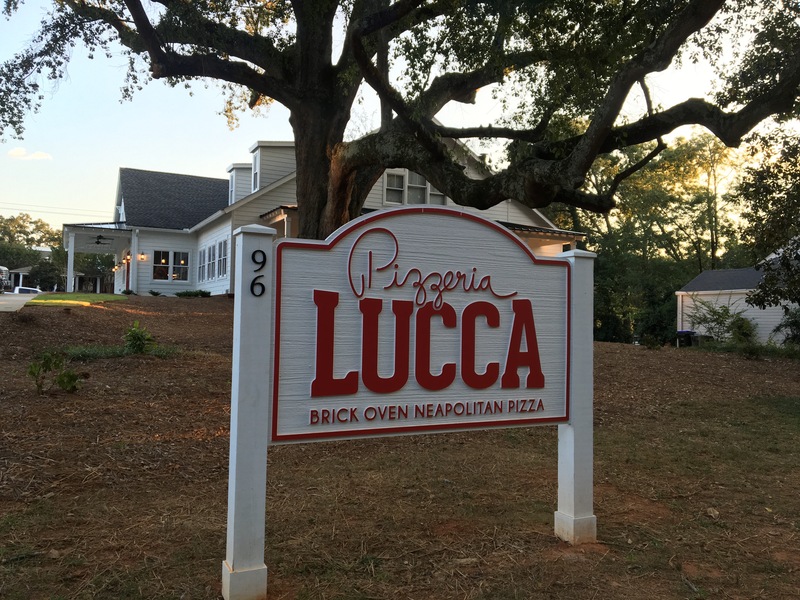 The bottom line on Pizzeria Lucca: This is not the place you want to go for a quiet date. The families of Roswell come, so expect a lot of kids running around. You will experience a lot of noise. If you want quiet, sit outside or get it to go. 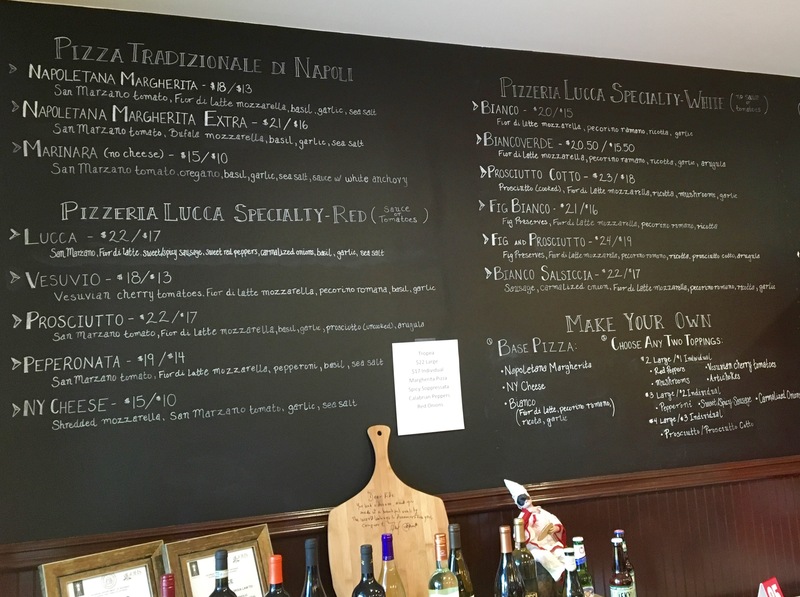 Our pizza was $21, which makes it more expensive (and unfortunately not as good) than you-know-where. We can only hope that the Bernardinis will buy some sound-proofing with their profits. I don’t care how good a place is, excessively LOUD is too much. On top of that, the cluster f*%k of the line and ordering would turn me off and away for sure! Thanks for all the good/bad reviews – helps me decide where to go next. The pizza looks tasty. 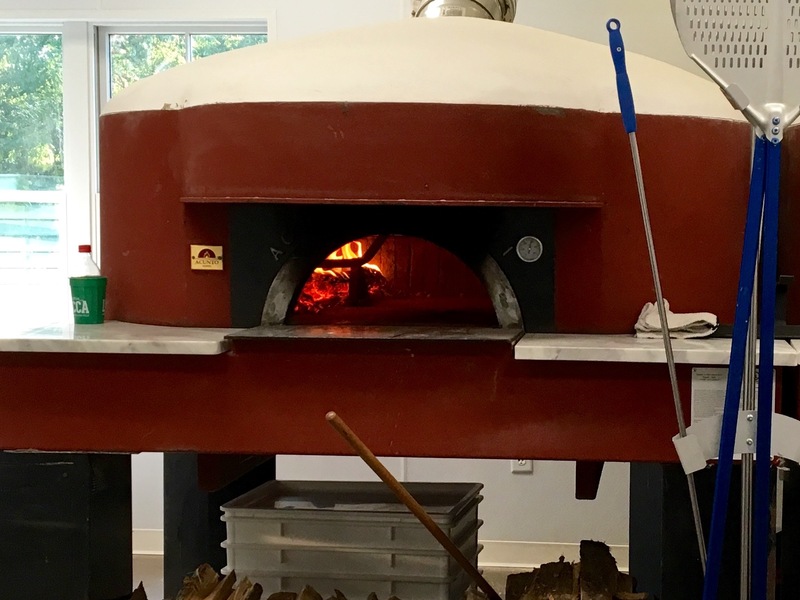 Never had a pizza from a brick oven before. A must on my list!